Sales declines of Chevrolet's best-selling models, including the Spark minicar, have contributed to the brand's 33 percent sales slide during the first four months of this year in a total market down 7 percent. Chevrolet, General Motors' best-selling brand globally, is falling further behind rivals in Europe as the region's buyers turn their backs on the marque's aging products. Chevrolet is positioned as a value brand in Europe and its Spark/Matiz minicar and Aveo subcompact account for almost half of the brand's volume. 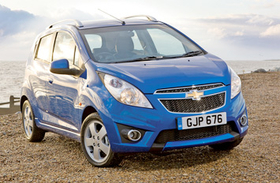 As Europe plunges deeper into economic crisis, car buyers increasingly are turning to affordable smaller vehicles, a trend that should help Chevrolet. In the first four months of this year, sales of the Spark/Matiz declined 37 percent to 12,245 units from the same period of last year, according to figures from JATO Dynamics. The Aveo declined 44 percent to 10,235 in the same period. Steep declines of Chevrolet's best-selling models in Europe pushed down the brand's sales in the region 33 percent to 45,706 in a total market down 7 percent, according to ACEA, the European industry trade group. Chevy's market share was 1.1 percent, down from 1.5 percent during the same period last year. Meanwhile, budget rivals such as Dacia and Kia posted sales gains in Europe during the first four months. Dacia's volume rose 18 percent to 90,162, giving the brand a 2.2 percent share, while Kia's sales increased 4 percent to 112,795 for a 2.7 percent share. Analysts say an aging product lineup and lack of focus on Europe have hit Chevrolet's vehicle sales. Most of the brand's cars sold in Europe are built by GM Daewoo in South Korea. Hyundai and Kia have design and engineering centers in Germany and car factories in the Czech Republic and Slovakia. Renault's Dacia brand is based in Romania and is closely tied with Renault's headquarters in Paris. "Chevrolet isn't helped by products that aren't going to set the world on fire compared with Hyundai and Kia," said IHS Automotive senior analyst Ian Fletcher. Jonathan Poskitt, an analyst at LMC Automotive, said Chevrolet's major products are losing sales because they are aging. "The Spark and Aveo are high-volume models for the brand, but they are past their peak market share," he said. Chevrolet cars are less fuel efficient than newer models from competitors. High fuel prices and taxes that penalize vehicles with high carbon dioxide emissions mean that fuel economy is an increasingly important factor for sales success in Europe. The average CO2 emissions for Chevrolet's new-car fleet in Europe was 141 grams per kilometer, or 8 ounces per mile, in 2012, according to JATO Dynamics. The figure placed Chevrolet No. 18 in a ranking of 20 manufacturers, behind BMW and Mercedes-Benz. Analysts say overlapping products with GM's Opel and Vauxhall brands also hurt Chevrolet. IHS's Fletcher highlighted the overlap between models such as the Chevrolet Trax/Opel Mokka and the Chevrolet Captiva/Opel Antara. "There are certainly some mixed messages in its range," he said. Chevrolet declined to comment for this article but Opel says the two brands do not attract cross-shoppers. "Opel and Chevrolet have deliberately been given a distinctive brand positioning and aim at different customers," Opel said in a statement last month. "Studies show that the risk for each brand to lose customers to the other brand is low." Fletcher said price discounting in Europe's weak auto market has brought Opel closer to Chevrolet. Opel vehicles are priced higher but discounts make Opel's prices similar to Chevrolet's. Globally, Chevrolet is doing well. GM announced record first-quarter sales of 2.4 million for the brand, up 4 percent on the year before. But Chevrolet will continue to struggle in Europe for years to come, analysts say. IHS forecasts that Chevrolet sales will continue to fall in the region until 2016, which is when the Spark and the Cruze compact are scheduled to be replaced. Chevrolet sales fell 3 percent to 172,000 cars in Europe last year, according to ACEA. The brand's EU sales will rise to 200,000 in 2016 on new products, IHS predicts, after hitting a low of 148,000 in 2015.